This turn of the Greater Wheel moves us towards a place of newness and the quickening of what was brought to light at Yule, the Winter Solstice. We stand at the mid-mark between the act of revealing (Winter Solstice) the fertility that lay dormant from the triple harvest and the action of sowing and planting (Spring Equinox) what we hope will prove viable and grow to its fullest potential. This is the time of quickening and enlivening the hidden seeds of transition and preparation of what will wither and die and what will germinate a become viable product. Our coven, Oak and Willow of the Assembly of the Sacred Wheel Tradition, uses Imbolc to focus on the Celtic Goddess, Brighid. We craft candles, infusing them with her healing properties. We make oath and re-dedicate to our Coven and Tradition that the quickening of our minds and hearts awaken what can blossom in the months ahead. And, we call upon her creativity to inspire us as we move forward towards the next turn of the Wheel. This year we will call forth the Goddess as Warrior and wielder of the healing sword. For most, the first encounter with this fiery Goddess is one associated with her triune nature. She is Maiden, Mother and Crone holding the keys to creativity, inspiration and deep healing. She is also the Triple Flame, acting as central catalyst of the purpose intended and initiator of those who willingly cross the threshold of transformation. As the patroness of poets, divination and prophecy she is the Fire of Inspiration. In her role of patroness of healers and Goddess of fertility, she is the Fire of the Hearth and childbirth. And, as patroness of smiths, craftsmen and the forge, she is the Fire of the Forge, burning brightly and transforming and transmuting all that enter the heat of the flame. But, there is also a lesser-known aspect of the Goddess Brighid. Her ancient name of The Fiery Arrow gives some indication of this aspect, although it is usually associated with the Goddess as maintainer of justice and right action; setting the course of action in a balanced way and clearing away all that would interfere or challenge that state. If we take this idea to a deeper place of understanding, Brighid’s energy becomes that of the Warrior who wields the flaming sword that destroys, cauterizes and then heals. It is She, who heals with the precision of the surgeon guiding the scalpel. She, who cuts through the glamour and unyielding ignorance of ego driven will and carves the path of knowledge that becomes true gnosis. And, it is She, who plunges the un-tempered blade of inventive mind into the hellish fires that forge and manifest a blade that is pure, clear and strong in its action and intent. I have worked with this aspect of Brighid for many years and in many ways, and the mark of its transformation has been lasting and opened the way for growth and a deeper understanding of the process of release and healing. Just as the sword’s blade goes through multiple steps of heating and cooling, resting and shaping to achieve the brilliance and beauty of what will become a finely crafted sword; the process of this healing warrior Goddess tests the metal of your own making. She allows you to see the rough product that is your will and plunges you deep into the flaming desire for what you wish to achieve. If you remain too long from inertia or misguided will, what emerges is misshapen and unusable. It’s brittleness breaks your spirit and the wounds it inflicts are jagged and long to heal. If tempered with enough flexibility to change course as needed, the honing and sharpening of the skills required for successful change are exacted. All is brought to the quickening fires so that what has been reshaped and reformed may become as one and part of the finished product. A time of rest and integration occurs and finally as the blade is brought from its place of synthesis and strengthening, it is plunged once again into the heart of greater Will and the flames of Intentional Desire. The finished product is a work of beauty and a gift from the forge of Brighid. I offer to you a pathworking, inviting you to invoke the energy of Brighid’s Healing Sword and the opportunity to stand in Her radiance of remaking. May your journey be powerful and may the Goddess bless you with the crafting of your own healing blade. Brigit the Melodious Mouthed of the Tribe of the Green Mantles. She is Goddess, Saint, and Faery Woman; She is Healer, Poet and Smith; She is Mother of Songs and , The Flame in the Heart of All Women and Mother of All Wisdom.1 Brighid, Goddess of the Hearth Fire, has many names known throughout the lands She was once worshiped and honored. As a Goddess that has survived through time under the guise of Saint, She has never been forgotten. She lives on in the hearts of Her people, healing the wounds left by the trials of life. She is Saint Brigid, Foster Mother of Christ, and St. Brigid of Kildare where nineteen nuns tended a perpetual flame in Her honor. She is the patron saint of poets, children midwives and livestock.2 Ever present, Saint Brigid is still honored today by many Catholics and Pagans alike. Through Her healing nature and deep well of wisdom, She gathers Her children under Her mantle, filling them with Grace and Tranquility. Known as Breo-Saighit and Bride in Scotland, Brigit in Ireland, Brigandu in France, Brigantia in England, and Ffraid in Wales3, Brighid and Brigid are now the most common spellings used. The most popular meaning for Her name is The Exalted One. She is the fiery or bright arrow, the bright flame of inspiration and is said to be the daughter of the Dagda, the Good God of the Tuatha De Dannan. As Hearth Goddess, Brighid, or Brigandu as I like to call Her, is one of the most popular of the Gods to be worshipped in the home. She is a Goddess of healing and abundance, bringing health and prosperity to the home of those who worship Her. Brigandu is the Bright Faery of Wisdom and Inspiration, bestowing a wealth of esoteric knowledge when called upon. She is Lady of Fire, warming our homes and hearts with Her presence. 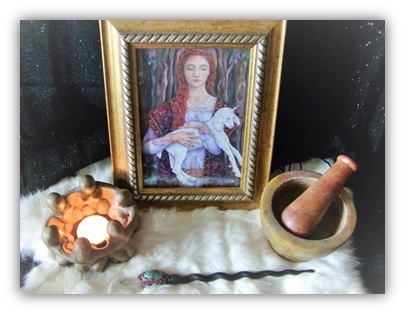 Imbolc, also celebrated as Candlemas, is Brighid’s Holy Day. Celebrated on February 2nd, Candlemas, or the Feast of Lights, is a festival of Renewed Life. It is when the first stirrings of Spring are found and the warming of Earth begins as the Old Crone, Cailleach, passes Her White Wand of Winter to Brighid as it turns into the Green Wand of Spring. Brigandu is Goddess of Magic, enchanting the Land She walks upon and charming the hearts of those who love this Bright Queen of Faery. She can be called upon while creating prayers and spoken spells, kindling the Creative Spark of Inspiration. Embrace the healing powers of Brighid as you brew teas of health and wellness, infusing them with love and compassion. Find comfort in the warmth and prosperity She bestows upon our homes, remembering to give thanks to The Exalted One. Create Bridie Dolls and Bridie Crosses in Her honor; the book Candlemas Feast of Flames by Amber K & Azrael Arynn K has instructions on how to make these.